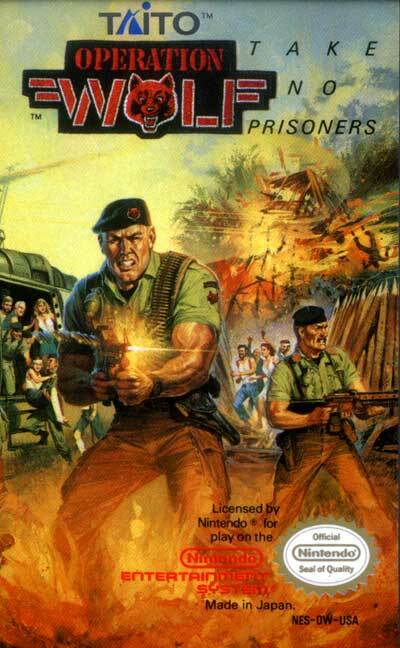 A group of desperate terrorists is keeping hostages in their jungle fortress. As a member of the elite tactical squad Operation Wolf, you must invade their hideout, destroy their operations, and get the hostages out alive! Maneuver through a series of missions and fight off soldiers, patrol boats, helicopters, and more. The further you progress, the more enemies you'll have to defeat and the harder they'll try to stop you in your tracks (going so far as tossing knives and grenades at you or wearing armor). Each area along your path ends with a boss battle where you'll have to find and exploit each boss's particular weakness. To top it all off, your weapon options are also limited, so you'll need to conserve ammunition and grenades. Operation Wolf is said to be the most valiant and capable unit in the military-can you save the hostages and win the day?